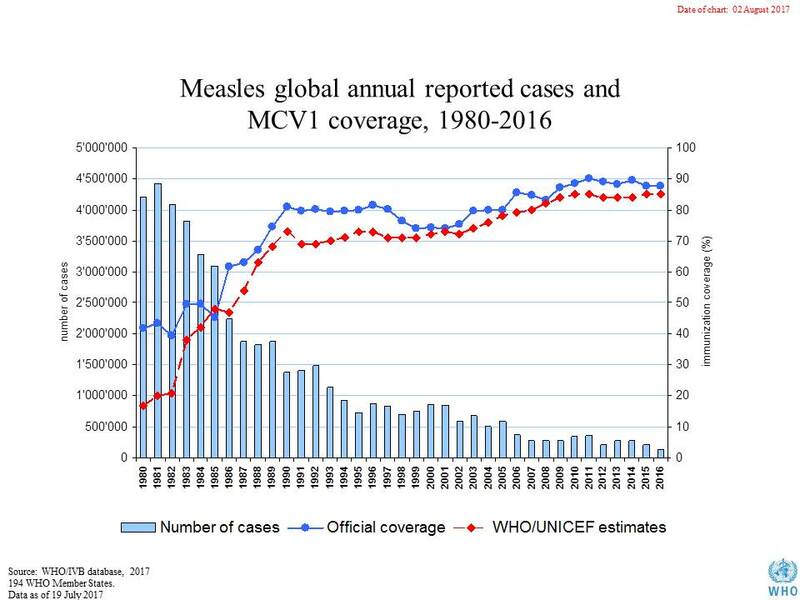 The World Health Organization (WHO) shows us that global measles vaccination coverage increased, while measles incidence decreased. But how can we know that the one caused the other to happen? The WHO and World Bank track available vaccination coverage and measles incidence data for every country in the world, since 1980. Assuming increases in measles vaccinations are the cause of the decrease in measles incidence, we would also expect to see this effect when we compare data from individual countries. Thusfar, nobody ever used the available data this way. I used available WHO and World Bank data to see how changes in measles vaccination coverage relate to changes in measles incidence. I was able to include data from 1980-2015. I also split up the data so that I could look at results over 10-year periods. Giving me more data to work with. I found no relation between changes in vaccination coverage and changes in measles incidence between 1980-2015 (59 countries), or 1985-2015 (129 countries). There was a weak beneficial relation between vaccinations and measles over the 10-year periods. But this effect disappeared when baseline measles incidence was taken into account. According to the World Health Organization (WHO), unvaccinated young children are at highest risk of measles and its complications, including deaths. Any non-immune person (who has not been vaccinated or was vaccinated but did not develop immunity) can become infected. Routine measles vaccination for children, combined with mass immunization campaigns in countries with high case and death rates, are key public health strategies to reduce global measles deaths . The following graph can be found on the WHO website . 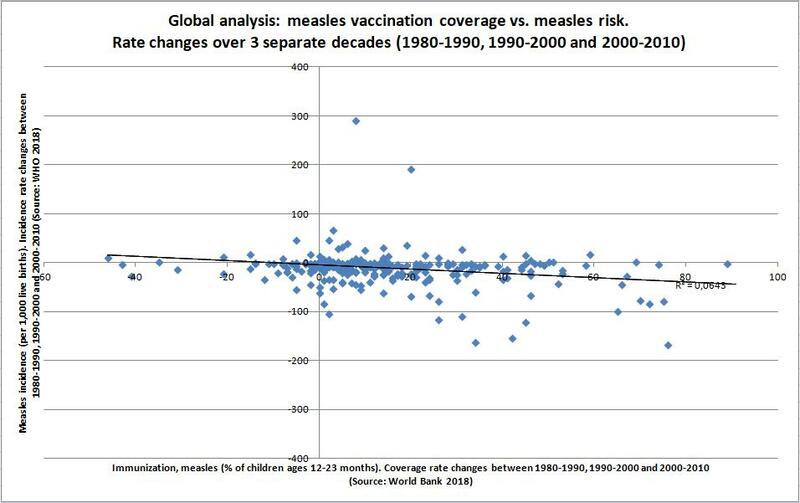 Showing that global measles incidence decreased at the same time vaccination coverage increased. The fact that vaccination coverage increased while the number of cases decreased, does not necessarily mean that the one caused the other to happen. More indepth information can be obtained by comparing the differences between countries. Data about measles vaccination coverage can be found on the World Bank website . This is available as “Immunization, measles (% of children ages 12-23 months)”. Data about measles incidence can be found on the WHO website . This is available as the number of reported cases per country. Since the last data cannot be used to compare differences between countries, or differences over time periods, I calculated this data to measles incidence per 1,000 live births. A form much other data is also presented in [3, 4]. The World Bank also has data about population size and birth rate per 1,000 people . I could use these to transfer data about measles incidence into the form needed. Data about possible confounders can be found on the World Bank website as well . Birth rate data is available through 2015. Therefore, the year 2016 could not be included in the analyses. I will present data in 2 ways. 1) Long term correlations over a 30- to 35-year period. 2) Short term correlations over 10-year periods. The choice to also present data over 10-year periods was made “a priori”. There is a limited amount of data available for the various potential confounders. Limited because not all countries had data available. And limited because availability varied over the different years. Taking into account 10-year periods potentially enables more thorough adjustment for possible confounders. It also increases the amount of comparisons, enabling stratified analyses. Statistical software PSPP was used to examine all correlations. If there were zero measles cases in either the beginning or the end of the follow-up period, the data was included in the analyses. But if there were zero measles cases in both the beginning and the end of the follow-up period, the data was excluded. It is impossible to test if vaccines change the amount of measles cases when no cases were present. For the rest, no data was excluded from any of the analyses. 1) Long-term vaccination effect. 30- and 35-year time periods. 30-year decrease in measles risk cannot be attributed to changes in vaccination coverage. Figure 1 shows how changes in measles vaccination rate coverage relate to changes in measles risk when we look at the period 1985-2015. Data was available for 129 countries. We can see that measles incidence decreased in almost all countries, regardless of the change in vaccination rate. An inverse triangle can be seen. The trendline is almost horizontal and the R-squared value is .0025. Meaning zero % of the variation in measles incidence can be explained by vaccinations. Results were similar for the 35-year period, which included data for only 59 countries (see table 2). Figure 1. Relation between changes in measles vaccination coverage and measles incidence over 30-years. Time period 1985-2015. Very limited data for possible confounding factors was available over these time periods. Living in a rural vs. urban region may influence the chance of cathing the measles. It seemed logical that clean water and proper sanitation would influence measles risk. Data for these possible confounders is available from 1990-2015. Therefore, I included a third long term time period (1990-2015) to see if these factors would influence measles risk. How these factors were related to measles incidence, can be seen in table 1. Table 1. 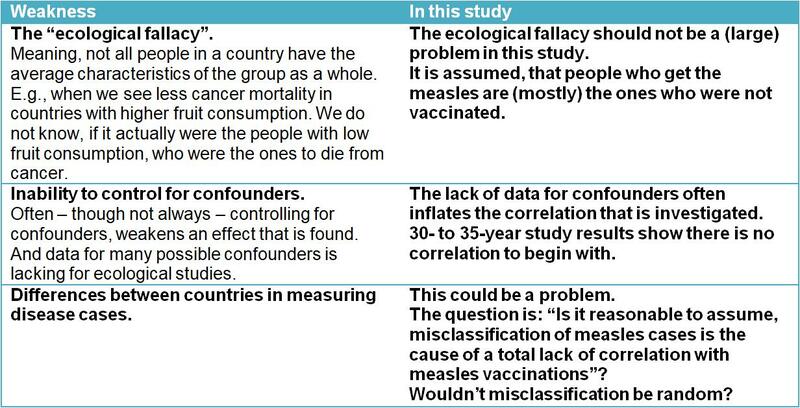 Examining the relation between possible confounders and measles incidence. Changes over a 35-, 30- and 25-year time period. The first number is the R-squared value. The second number is the unstandardized coefficient. * = P for significance: < 0.05. Green colour indicates a negative association (beneficial effect with higher exposure). – = no data available for correlation. A weak correlation (R-squared value .04) was found between the % of people living in rural areas and measles incidence for the 35-year time period. No other associations were found. Vaccination coverage in relation to the measles. Results. Table 2 shows the relation between changes in vaccination rate coverage and measles incidence. R-squared values for the different time periods were all .00. Indicating that zero! % of the variation in measles incidence can be eplained by the vaccinations. No beneficial correlations were found over the 30- and 35-year periods. All unstandardized coefficients were slightly positive. Indicating increasing vaccination coverage was related to slightly more measles cases. These correlations remained after adjustment for vaccination coverage at baseline (first year in the time period) and/or measles incidence at baseline. For the shorter time period 1990-2015, increasing vaccination coverage was related to slightly less measles cases. None of the correlations reached statistical significance. Though 30-year increases in vaccination coverage were related to a borderline significant increase in measles incidence after adjustment for baseline measles incidence (Unstandardized coefficient = .19; P = 0.051). Table 2. Changes in vaccination rate coverage in relation to changes in measles incidence. Effects over a 35-, 30- and 25-year time period. Unadjusted and adjusted effects. n = number of countries included in analyses. * P for significance = 0.051. As described earlier, only one potential confounder was detected (table 1). It related the % of population living in rural areas to measles incidence from 1980-2015. 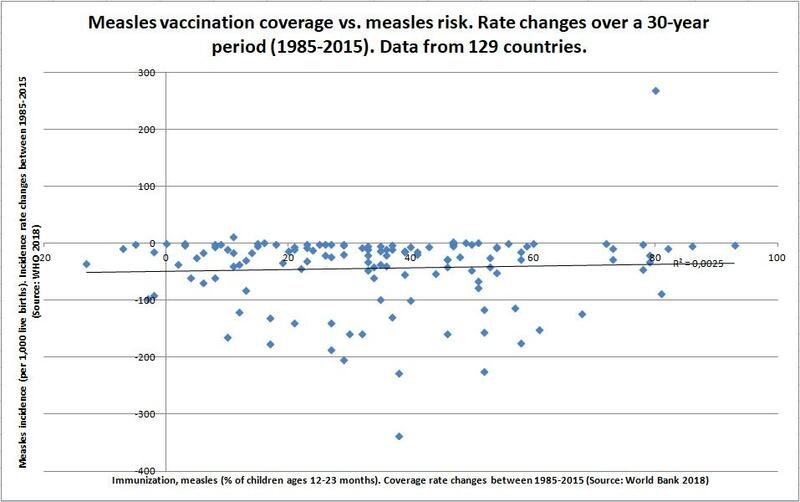 Statistical adjustment for this factor did not change the correlation between vaccination coverage and measles incidence (unstandardized coefficient for vaccination: .14). A strong relation between changes in measles incidence and baseline measles incidence was found. This is unexpected and would suggest a lack of effect from vaccinations. Figure 2 shows how the global decrease in measles between 1985-2015 is related to measles incidence at the beginning of this 30-year period. The R-squared value shows a strong correlation (.87). In the graph, we see one country clearly further away from the trendline (outlier). Excluding this outlier, would increase the R-squared value to .997. Which means that 99.7% of the variance in change in measles incidence can be explained by baseline values. Except for the outlier, almost all dots are close to the trendline. Showing that measles incidence decreased to a similar % across most countries. We would expect the dots to decline in the graph. But we should see variation in the rate of decline. …. Short explanation…..
We would only expect the dots to be so close to the trendline when all countries would be exposed to the “protective” factor (vaccinations) to a similar degree. But I found no correlation between baseline measles incidence and 30-year changes in measles vaccination coverage (R-squared value = .00). Meaning that the countries were exposed to the “protective” factor to a varying degree. Figure 2. Most dots are close to the trendline. Meaning the % decrease in measles incidence is similar across most countries. 2) Short-term vaccination effects. 10-year time periods. A very weak correlation between 10-year changes in vaccination rate coverage and measles incidence. Figure 3 shows how changes in measles vaccination rates were related to changes in measles incidence when we look at 10-year periods. Data was available for 311 time periods. We can see the dots spreading in every direction form the center. Measles incidence increases and decreases, regardless of the change in vaccination coverage. There was a significant beneficial association with vaccinations. But the R-squared value was .06. Meaning that only 6% of the variation in measles incidence could be explained by the changes in vaccination rate. Figure 3. Relation between changes in measles vaccination and measles incidence over all 10-year periods for which data was available. It is difficult to define which health indicators can with certainty be considered confounders. Table 3 shows health indicators, most people would agree, can influence measles risk. Table 3. Examining the relation between possible confounders and measles incidence. Changes over a 10-year time period. No significant relation was found between any of the potential confounders and measles incidence. Most of the R-squared values were .00. Which means that zero % of the variation in measles incidence can be explained by changes in clean water- and sanitation facilities. There will always be debate as to include an indicator as a possible confounding factor. Factors that may directly or indirectly say something about the health status of a population. The ones in table 3 were the ones that could be directly related to the spreading of infectious diseases. No associations were found with GDP, government expenditure on education, primary completion rate, PM2.5 air pollution, public health expenditure, maternal mortality, undernourhisment, life expectancy, vitamin A supplements, clean fuels for cooking, HIV aged 0-14, or depths of the food deficit. All R-squared values were .00 to .01. All P-values for significance were > 0.12. Figure 3 showed a weak beneficial relation was found between measles vaccinations and measles risk. Tables 4-6 show additional analyses using this data. No significant effect modification by baseline vaccination coverage. Table 4 shows that a significant beneficial effect was only seen at low baseline vaccination coverage (< 50% coverage). But the direction of the effect was similar for all levels of baseline coverage (Unstandardized coefficient = -.18 to -.47). Additionally, adjustment for baseline vaccination coverage did not change the results. 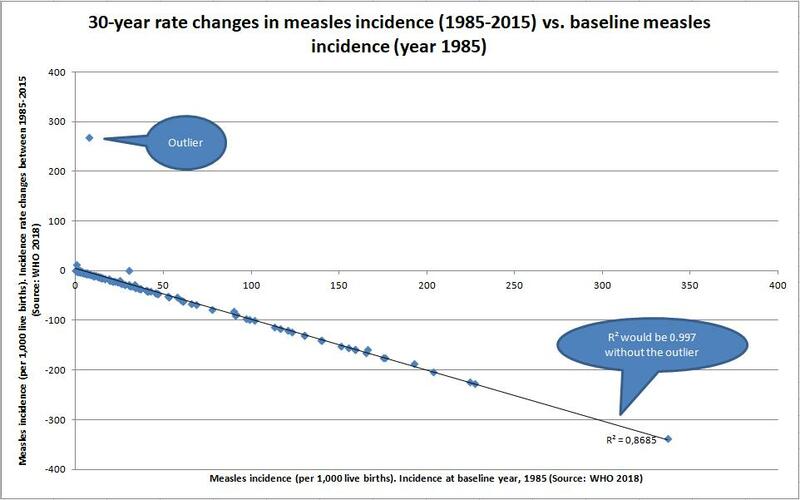 Possible effect modification by baseline measles incidence. Table 5 shows how baseline measles incidence influenced the results. We see that vaccinations were related to increased measles incidence in countries with low baseline measles incidence (< 1 per 1,000 live births). While vaccinations were related to decreased measles incidence in countries with higher baseline measles incidence (> 10 per 1,000 live births). In tables 4-6 we can also see that all significant effects disappeared after adjustment for baseline measles incidence. Table 6 shows that beneficial effects from vaccinations were only found in countries with increases in vaccination coverage. And in countries with decreases in measles incidence. Something we would not expect when there is a true effect from vaccinations. Table 4. 10-year changes in measles vaccination coverage & measles risk. Stratified by baseline measles vaccination coverage. Unadjusted and adjusted associations. * P for significance = < 0.05. Green colours indicate a negative association (beneficial effect with higher exposure). Table 5. 10-year changes in measles vaccination coverage & measles risk. Stratified by baseline measles incidence. Unadjusted and adjusted associations. Table 6. 10-year changes in measles vaccination coverage & measles risk. Comparing increases vs decreases. Unadjusted and adjusted associations. Weaknesses of this type of study. These are summarized in table 7. The most familiar potential problem with ecological studies, is what is called “the ecological fallacy”. But it seems unlikely that this could have caused the lack of an association between vaccinations and measles incidence. Table 7. Weaknesses of the type of study I performed (ecological study). I found a weak beneficial relation between measles vaccination rates and measles risk, when I looked at changes occurring over a 10-year period. This beneficial effect did not remain after adjustment for baseline measles incidence. The beneficial effect was only found in subgroup analyses. No relation was found between 30-, or 35-year changes in measles vaccination coverage and measles risk. It is unlikely that a possible effect was masked by differences in baseline vaccination coverage and/or baseline measles incidence. Since the lack of an association remained after adjustment for these factors. There was a strong relation between changes in measles incidence over time and baseline measles incidence. The graph showed most dots are in a fairly straight line. Showing the % decrease in measles incidence was similar in most countries. There was a relation between % rural population per country and measles risk. This relation was weak and only found over 1 time period. No other potential confounder was related to measles risk. These results are unexpected, given the assumption that increases in measles vaccination coverage are said to be THE reason why measles incidence decreased. We would have expected a strong correlation between vaccinations and diseases incidence. Which should remain after adjustment for a wide variety of confounders. Since the changes in measles vaccination coverage varied across countries, the % decrease in measles incidence over time should not be similar for the individual countries. We might have expected increases in clean drinking water and sanitation facilities to have contributed to the global decrease in measles incidence. But neither vaccinations or any potential confounder could be linked to measles incidence. The question is how these findings fit into the complete picture. This information by itself cannot prove or disprove that vaccinations decrease measles risk. But it does raise the necessary questions. How is it possible that there is not even a weak beneficial relation between vaccination coverage and measles incidence over a 30 or 35-year period? How come, the % decrease in measles incidence over time is similar in most countries? Should this not be dependent on the exposure to vaccinations? I don’t advice anybody to use not use vaccinations! I do recommend that you ask critical questions to health care organizations. Ask them to repeat the analyses I did to see if they get the same outcome. Don’t accept it when they ignore “unwanted” results. Demand an explanation.